The inaugural voyage of the Outland Institute radio show set sail today – Josh Kinal assures me that the “one show anniversary” is traditionally lined notepad paper, freshly torn. And who am I to say he’s wrong? You can find the podcast in the usual places or download it directly from here! I know it might seem lately that I’ve neglected you. I don’t write as often as I once did, and perhaps you think my love for you has waned. Nothing could be further from the truth. Actually, that may not true – there’s probably some things that are further from the truth, like “space octopi open convenience store in Geelong”, but you get the drift of my gist. While updates to this site have been – let’s say “sluggish”, shall we? – behind the scenes it’s been all systems go. Or go-ish. On Friday July the 10th the exciting new radio version of The Outland Institute will be unleashed, and your ears will never be the same. Every Friday from midday to 2pm (Melbourne time) we’ll be exploring pop-culture in audio form on Joy 94.9. There’ll be plenty of exciting guests, plus some boring ones to make up the numbers. And we have a glamorous selection of resident experts, including Josh Kinal from Boxcutters, Glenn Dunks from Stale Popcorn and Anne-Marie Peard from Aussie Theatre. There’s even a theme tune by David Ashton from Destination Moon – take that, ABC 2’s News Breakfast! Not so big now! So please join us on the 10th of July – you can listen on the wireless at 94.9FM in the Melbourne metro area, or hear it streamed wherever you are through http://www.joy.org.au/listenlive, or download the podcast version from the Joy website (I’ll provide more podcast details in due course). And keep listening after the show for Flip The Tape, Joy’s fantastic indie/eclectic music show hosted by Adam C. It’s grouse. The website will also continue to function, with both complimentary and new material, plus you’ll be able to comment on the radio show and basically make life just that bit more bearable. To finish with, let’s look at some Canadian bilingual kite-flying, set to The Free Design‘s 1967 classic Kites Are Fun. I had the pleasure this week of being a guest host on the Boxcutters podcast, along with the ever-delightful Josh Kinal and Brett Cropley. Yes, a podcast – it’s a bit like what I would call “being on the wireless”, only it doesn’t exist anywhere. Or it exists everywhere. Like Skynet from The Terminator. Anyway, Boxcutters is a weekly show about television, so part of the show involved discussing TV projects I’ve been involved with. I was trying to be on my best behaviour throughout, but God knows if I succeeded. I do have a tendency to go on a bit, so it’s turned out to be one of the longest Boxcutters ever, and that’s even with me manically speeding up as the show goes on. So if you want to hear me rant about Battlestar Galactica, defend Six Feet Under, and jabber on about meerkats, simply click here. Ironically, even though Boxcutters is a high-tech information-superhighway zero-gravity-haircut hoodie-and-skinny-jean wearing podcast, it’s recorded in a radio station. Old school. 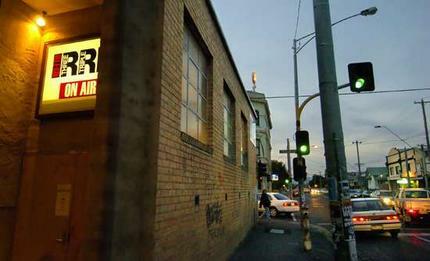 The radio station in question is none other than Melbourne’s much-venerated RRR. This brought back memories for me, as I spent a lot of time at the Rs back in those heady days of the early-to-mid 90s. We were young then, and it felt like the summer would go on forever (or something). Every day promised another Killjoys record, or an Angie Hart lookalike walking up Brunswick Street carrying a sunflower. Remember sunflowers? Remember when they were really in?